In case you haven't checked it out yet, Scott Kurtz, Brad Guigar, Kris Straub, and myself have launched an ambitious weekly podcast filled with comics shop talk -- the how-to and pro-tip stuff you can't find anyplace else. Every cartooning instruction book and how-to out there is focused on "getting your strip into the whiz-bang world of newspapers", which is great, if you live in 1975. But the future of comic strip cartooning is online, and there's a scarcity of information out there on how to make the art and business aspects work. So this weekly podcast will be our answer to that void: shop talk and tips from four cartoonists making their living online. You can follow the RSS here. Episode Three: How to legally protect your work, picking the appropriate resolution for your scanned work and more tips and tricks. Episode Two: What happens when someone doesn't "get" your joke. How to get new readers. Tips and Tricks. 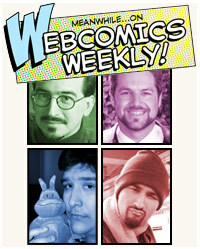 Episode One: Brad Guigar, Dave Kellett, Kris Straub and Scott Kurtz outline their new weekly podcast about the ins-and-outs of making comics for the web.